Gardener's like to indulge in the anticipation of blooms from our reliable performers. We just kind of keep our expectancy reserved until we see signs that any one of those particular plants is actually going to bud out right on time. At which time our hopes become realities and we ditch all doubts in exchange for humble thankfulness that another plant is happy and secure assuring us we must have done something right in the nurturing. Being that November is the middle of autumn and generally gardens can be (depending on weather) winding down a bit here in Florida all November bloomers are especially celebrated. 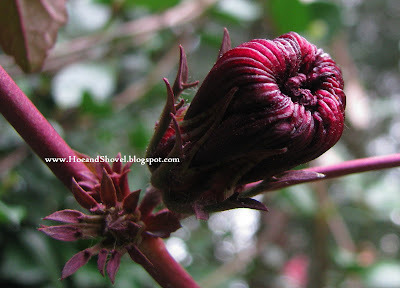 Adding to its appeal and probably the most distinctive characteristic of the Hibiscus sabdariffa or often called Roselle, Jamaican Tea, Maple-Leaf Hibiscus, Florida Cranberry, October Hibiscus, Red Sorrell~~ is its outstanding burgundy-colored maple-shaped foliage. In a photo taken earlier this month (above) the sunlight streaming through it highlights the veining in each leaf and the brightness of the new growth. 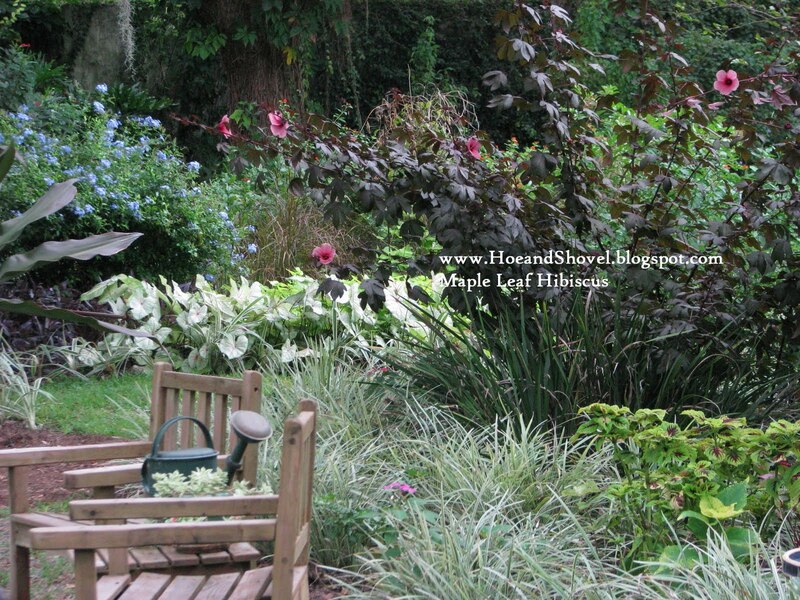 Here you can visualize how it contrasts so wonderfully with all the shades of greenery in the back garden. They were frosted to the ground last winter. Recovering quickly in spring, I have been consistently pruning these vigorous growers back since then. My goal was to keep them more compact and bushy and from getting too tall and leggy as they tend to do if left on their own. Even so, they are towering over me in height. Note to self: be even more aggressive next year. 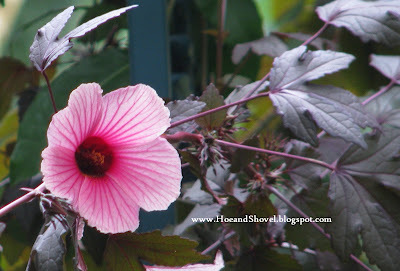 As with all hibiscus, each bloom only lasts about a day but fortunately on the maple-leaf the buds form along the length of each stem. 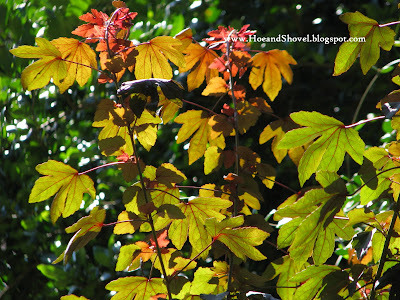 The flowers that grace the branches this time of year are a bonus bright spot to the already showy foliage. 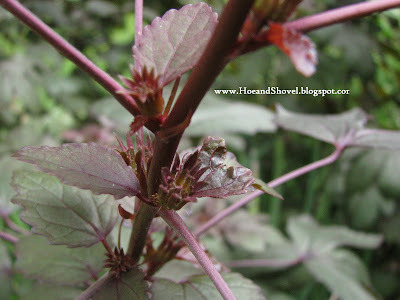 Besides having pest free habits, these hibiscus are one of the easiest plants to propagate by cuttings. It has been fun to pop these plants in the ground in several locations around Hoe and Shovel for the deep foliage I lean towards loving all year long. 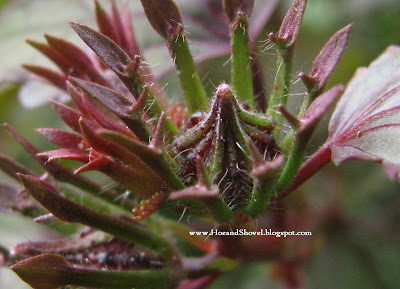 Okay, okay...I'm leaning towards this being my mystery plant, it has buds just like this one. Now, where do you have it planted? 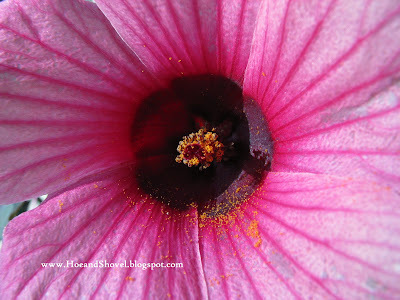 I have six of them from a mystery seed packet...they are mainly in the shade.........I do pray this is what mine is!!! Beautiful! That is what the blooms look like. I started one from seed this spring and it grew very tall but never bloomed. It would have probably done better not being in a small pot. I love yours it is so pretty.The dark foliage and pink blooms just go together so well. I well have to try it again next spring. Gorgeous Meems.... 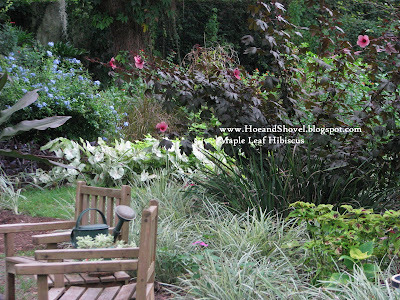 I love your maple-leaf Hibiscus... I had no idea they grow so fast... My My!!!!! I love mine!! And they root so easily.They are blooming like crazy right now,with this weather. I love this plant, I had one once ut it was lost to mealybugs. 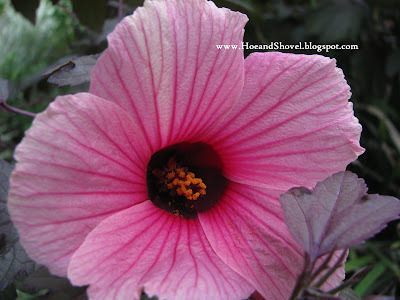 Meems, your hibiscus is gorgeous. We have one still blooming where I work. It is in town so I guess there is a microclimate that keeps it warm enough even at this time of year. Great plants. It's a real beauty. I can't wait to pop mine in the ground and enjoy the blooms next November. I had a hibiscus but sadly it met it's demise. It would bloom in winter till the frost would kill it. Strange we always had hard frost just when it was blooming. I love all your flower pictures, you should fee proud of having such a beautiful garden specially in autum, your back yard with all the color mixture project tranquility.. I love this plant and hope to own one, one day. It is just so beautiful.